The perfect way to introduce coin collecting to your child or grandchild! The reverse image recreates the 2011 cover of Action Comics #1, and features Superman as he runs from the authorities through the streets of Metropolis. The original artwork introduced a more modern take on a young Superman; wearing denim jeans and boots, Superman still maintains elements from his traditional costume with a blue shirt, red cape and the iconic 'S' shield emblazoned across his chest. Vibrant color enhances the engraved portrait of Superman, even adding a red glow to the streaks caused by bullets that do little to slow him down. A series of concentric circles frame the reverse, adding depth to the overall design and creating the illusion that Superman is racing out from the coin at breakneck speed towards the viewer. Your silver Superman coin is encapsulated and presented in a Royal Canadian Mint-branded customer paperboard box. 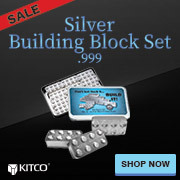 Why buy Silver Superman Coins from Kitco?